The policing of Black women and their bodies in the sporting world harks back to archaic pseudo-scientific racism. Recent events have shone a torchlight on the pockets of malpractice which litter the industry. Serena Williams is one of, if not the, most elite athletes in the world, and holds the most Grand Slam titles in singles, doubles and mixed doubles combined among active tennis players. Her serves are consistently powerful, and her forehand is considered among the most formidable in the game. She and Venus, her older sister, have been playing tennis since they were three. Williams is a master of tennis yet, amid this success, she has suffered the burden of navigating a seemingly hostile white space as a black woman. This year has been one of her hardest, and perhaps one of the most formative in her legacy. The birth of her daughter in 2017 was tumultuous: Williams endured a caesarean due to complications during labour, and the pregnancy left her with postpartum depression as well as numerous health problems. Following that, at the 2018 French Open, Williams was targeted by the French Tennis Federation because she wore a black compression jumpsuit while she played – an outfit that was made to support her body and prevent further blood clots. Postpartum haemorrhaging or excessive bleeding is one of the leading causes of maternal deaths. This altercation raised questions about the institutional racism and sexism that pervades sport. Williams’ experience here can be considered emblematic of the experiences of Black women in the USA. Black women are far more likely to have traumatic births and pregnancies than their white counterparts. Last year, a report by the Department of Health and Human Services found that cases of pre-eclampsia (dangerously high blood pressure) and eclampsia (the seizures that follow) were 60% higher in the cases of Black women in America, as well as more severe. This jumpsuit is now banned as it was deemed inappropriate. In one fell swoop, it appeared Williams’ own health was being disregarded because of her gender and race. Williams has also been the victim of a viciously racist and sexist press campaign, most visibly seen in the infamous issue of Melbourne’s Herald Sun. The paper published a cartoon earlier in September, which depicted Williams as a racist, ape-like caricature during the US Open match against Naomi Osaka. The illustration dehumanises Williams, and exaggerates her hair, nose and lips, undeniable markers of blackness. The cartoon juxtaposes Williams against Osaka by conveying her as white and blonde – a far cry from her Haitian and Japanese heritage. The cartoon is undeniably racist, teeming with violent stereotypes and stripping Osaka of her identity. This is a deliberate tactic to polarise the two women against one another. The cartoon, drawn by Mark Knight, depicts the moment where Williams was accused of cheating by the chair umpire, Carlos Ramos. Williams received a code violation for supposed coaching from the side-lines, a penalty point for throwing her racquet, and a game penalty. 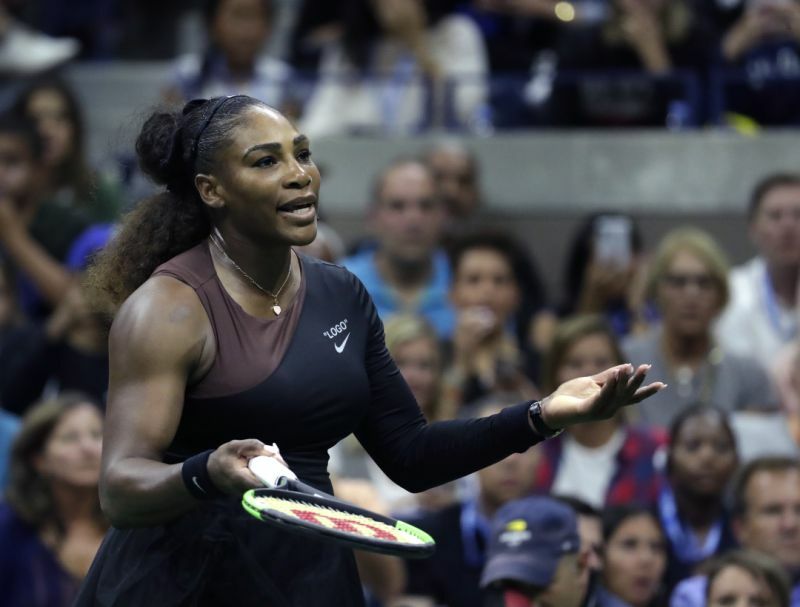 Whether she honestly cheated in the match remains unclear – watching it back creates a mess of feelings, from solidarity with Serena to sympathy for the umpire. Considering her legacy in the tennis world, her pain from the accusation can be felt. Moreover, it becomes clear that she was punished for occupying a traditionally white space, and for expressing anger. It has become upsettingly obvious that Serena Williams, her body and all that it means– her dark skin, her hair and her muscles – are consistently being policed in order to discredit and degrade her. In the eyes of white supremacist, patriarchal institutions like those found in sport, women like Williams are silenced.